Do a few puffs on an e-cigarette raise your risk of heart disease? It has been claimed that just 10 puffs on an e-cigarette is enough to trigger physiological changes that can lead to heart disease (but see our analysis below). Researchers from the Karolinska Institute in Stockholm say that inhaling e-cig vapour leads to a ‘rapid rise’ in levels of endothelial progenitor cells (EPC), which is indicative of damage to the inner lining of blood vessels, which can cause hardening of the arteries. During the study, which has been published in the journal Atherosclerosis, the researchers examined 16 ‘occasional smokers’ of traditional cigarettes as they took 10 puffs on an e-cigarette. Within an hour the rise in EPC levels had been observed. EPC levels were found to remain higher than normal for 24 hours. The study’s authors acknowledge the limitations of their research, saying: ’While it is an important finding that only few puffs of an electronic cigarette can induce a biological response that appears qualitatively similar to cigarette smoke, it is not clear how dangerous this is and whether this response is due to nicotine or other factors associated with the electronic cigarette use. This was a small study of 16 healthy volunteers to assess possible harms of using electronic cigarettes on blood vessels. There were two groups, randomly allocated by chance, and both groups were exposed to 10 puffs of an electronic cigarette. Researchers then measured levels of different cells that play key roles in the regeneration of the lining of blood vessels, called endothelial progenitor cells (EPCs), and can lead to atherosclerosis — that is, the build-up of fatty plaques. However, it is not clear why. Is this simply due to nicotine, and therefore would also be found with other harm reduction strategies such as nicotine patches or gum? Or is it due to other constituents in the vapour? Is this more or less than found with traditional cigarettes? Such findings would also need replicating in groups several magnitudes of order greater before we can apply these results to the real world. And they may still be due to chance. Indeed, tobacco and e-cigarette smoke, both active and passive, would need to be compared to see which causes more harm. But obtaining ethical approval for such a study would be challenging. Finally, the possible harms of cigarette smoking — atherosclerosis, high blood pressure, heart attacks, stroke and death — accrue over months to years, not minutes to hours. This is something this research cannot address. Based on this study, e-cigarettes still represent the lesser of two evils when compared to the evidence of overwhelming harm from tobacco smoke. But more research is needed on the long-term harms of e-cigarettes, both to the cardiovascular and respiratory systems. Furthermore, it remains difficult to say if e-cigarettes or other forms of nicotine replacement are safer than another. I think vaping is a lot less harmful than cigarettes and I see your point about tobacco companies maybe wanting to stop or slow the vaping industry – although a lot of them are invested in vaping. My concern with one of my son’s doing it is the unknown of sucking these products into his lungs day after day. The cumulative effect worries me. What happens with the various flavors and other additives when you breath it in deeply? Do they get dissolved and absorbed, or do they become like a thin varnish that builds up in time? I wish he wouldn’t do it. I appreciate that it helped him to break his cigarette habit, but I hope he can move on from his new one. Not all flavourings are necessarily FDA-approved. There’s a very, very wide range of products out there. That’s not to say that they ARE dangerous, of course, but the flavouring additives are wild cards compared to the VG and glycol. Not buying dodgy back-bedroom brands from market stalls is probably a good strategy for minimising this risk. Doubtful you will see any negative affects from 10 years of vaping, and by then we will have a lot more answers. If he or you are worried about regular use of some flavours, my view is to limit use of menthol and cinnamon. Agree! I have been vaping for 5 years already and didn’t notice any side effects. I vape low-nicotine e-juices with no diacetyl and still feel much better than before, when I smoked 20 cigarettes a day. Those days were awful! Now I share my experience on Vape Habitat – https://vapehabitat.com/ – a site me and my friend started to tell the truth about vaping and how to help people quit smoking effectively and with little issues. The thing they don’t really talk about is the release of microvesicles/microparticles (MV/MP) was much higher in the smoking test – in fact, of the four markers they tested only 1/4 markers (EPCs) was the same in the e cigarette study. And they only offer a couple of bits of speculation as to why there was no acute MV release when compared to the smoking study, including the fact that it might be because vapor is less toxic than cigarette smoke! In short, they only measured comparable results for the acute release of EPCs. And they even mention that acute EPC release due to particles in polluted air see a REDUCTION after 3 continuous weeks of exposure, so this may say nothing about smokers who’ve switched to vaping for at least 3 weeks, or indeed anybody that’s been vaping continuously for 3 weeks. Again, why gloss over the fact that there was barely any release of microparticles when the smoking study showed an acute release? Btw, this was 14 volunteers because 2 of the volunteers were rejected. The vaping community will never believe anything negative about vaping. Ever. They mock every study. They dismiss scientific research. They twist facts in their favor. More than a little pathetic tbh. I’ve been vaping for almost a year, helped me quit cigs, but I want all the information, good or bad, about the effects on my body. We just don’t know what harm is truly being done to our heart and lungs. Maybe it’s minuscule, maybe it’s massive, but we need to remain as objective as possible. Dubious scientific research should be ridiculed and dismissed. It is unfortunate that some people choose to believe any drivel that comes from the mouth of someone that has the letters “Dr” in front of their name. Your attitude is exactly what I’m talking about. We are inhaling chemicals, it is most certainly doing some damage. Simple logic. And the vaping community keeps quoting that same greek? doctor, but I guess that’s ok with you. Wake up, man. I trust “Dr.” more than I trust biased articles from the vaping world as well as uninformed commenters. I will agree that you are “simple”. All you do is blather generalities, you have not cited one freaking study. Exactly what vast information have you provided in your comments. Not one damn word of fact out of you and still you whine about lack of facts from others. All you prove is that anyone with a keyboard can be a condescending prick. You are being absurd, I’m not going to make the case that you are either too incompetent or too lazy to make yourself. Your attempt to change the subject to presidential politics is pathetic. Cite some evidence or be silent. I haven’t asserted anything, other than you have no evidence. And you prove my point with every empty word and personal insult you type. I suspect that the only research you have actually read is a few headlines that you thought sounded scary. 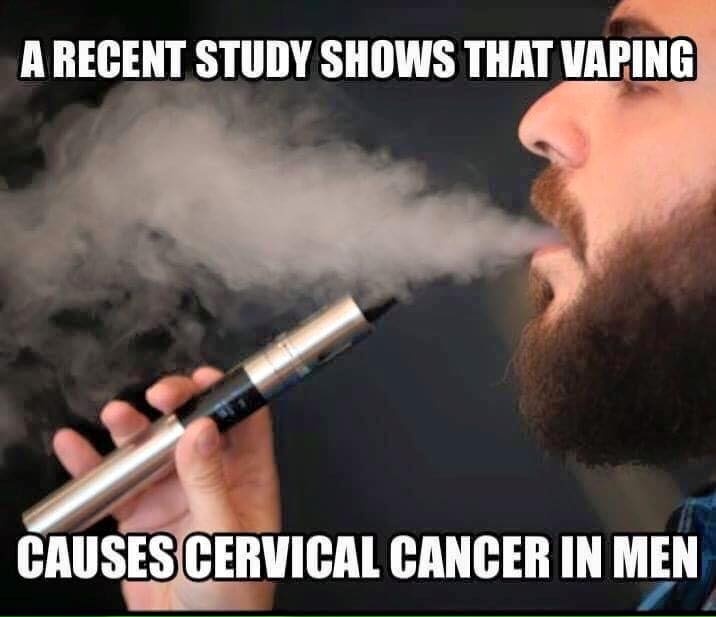 your sweeping statement that vapers mock every study is laughable. Vapers take every study done quite seriously, the ones that are mocked are the ludicrous studies such as these that are soley done by anti vaping sponsered organizations that hide behind the truth. As for inhaling chemicals.. sorry but again an ignorant reply. vaper have proved to be cleaner than the air we breathe in most modern cities so i suggest if your so concerned about breathing in “toxins” you lock yourself away in a sealed room and dont come out. Lol. You’re part of the problem and you’re in denial. Almost all vapers I come across, including those annoying youtube guys and gals, as well as social media commenters, mock all studies that are even slightly negative. Problem is, I’m objective and you and your brain-washed brethren are not. I vape, man, all day long. And no peer-reviewed study says vaping is cleaner than air. Seriously? Do you realize how ignorant that statement is? Wow. Quotes from the study regarding FeNO measurements: “Fractional exhaled nitric oxide (FeNO) has been shown to be well correlated with the degree of respiratory tract inflammation”, and the FeNO results: “Median levels of exhaled NO [ppb] did not differ significantly between the groups”. Sounds to me like they’re saying the FeNO test indicates there was no respiratory tract inflammation. I’m sure that the Karolinska Institute will be just as honest and truthful about vaping as they have been about Swedish snus. That is to say, not at all. For more info on this topic, review some of the writing by Prof. Brad Rodu of the University of Kentucky at Louisville. Been using E cigs for five years ,never felt better.